Since almost a decade now, the constantly updated Liquix is the standard E-Liquid calculator for vapers and e-cigarette fans. 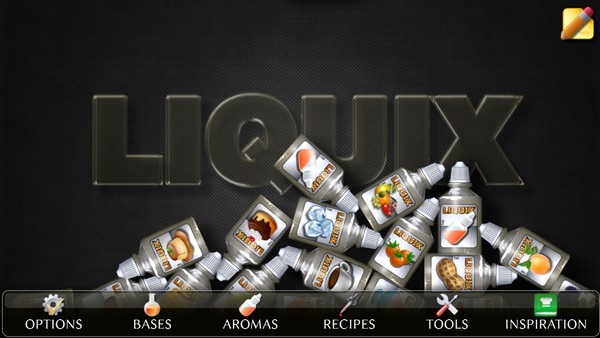 Liquix manages your liquid recipes, aromas and bases clearly, calculates the required amount of each ingredient when mixing your liquids and gives you access to thousands of online recipes for your inspiration. MIXING IS FUN Vaping is fun - so mixing a liquid should not feel like filling out an Excel spreadsheet. 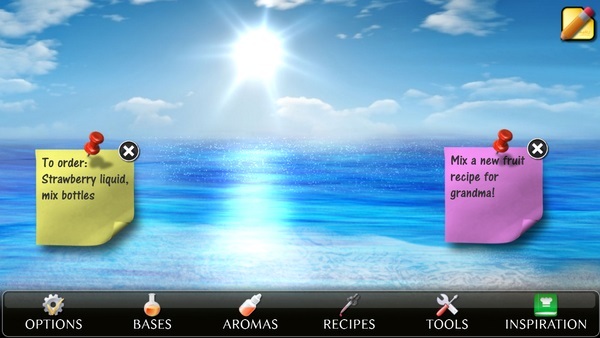 Liquix comes with a pleasant and colourful interface that is very easy to use, intuitive and self-explanatory. MIX BY WEIGHT, DROPS OR MILLILITERS Liquix shows you the quantities required for your liquid in milliliters, drops or weight (grams). The latter is very helpful if you want to mix by weight which is much easier and cleaner to do, as all you need is a fine balance and a few dropper bottles. MANAGING YOUR EXPENSES Liquix shows you not only the total price of your finished liquid, but also the price per ml and even the cost of each ingredient in your liquid. 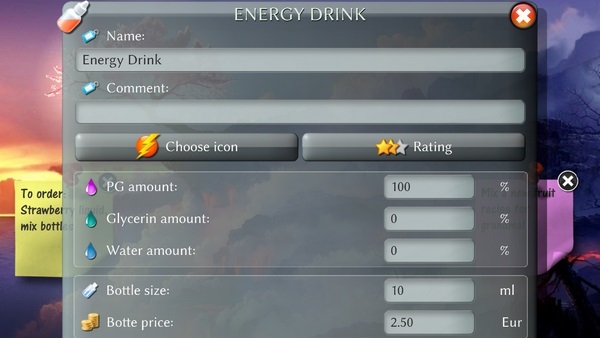 So you know exactly which ingredient makes up which part of the cost of your liquid. EASY MIXING For each of your basic ingredients and aromas you can specify its ingredients (PG, VG, water and if necessary nicotine), as well as the price and the purchase quantity. When mixing a liquid, simply select the desired bases and flavours and indicate the desired composition of your liquid - ready! Liquix then automatically calculates the required amounts and shows you the exact costs of your liquid: per milliliter, per ingredient and total. 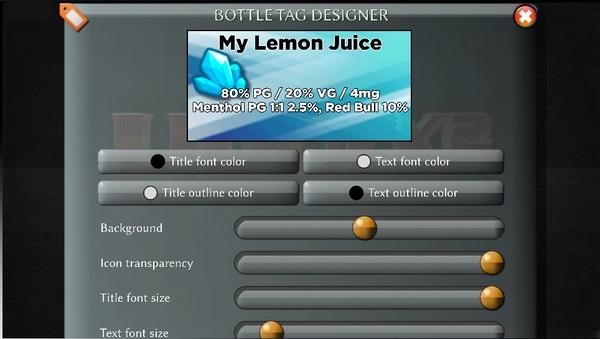 BOTTLE TAG DESIGNER The integrated label designer creates appealing bottle labels for each of your recipes in seconds and with no effort. OVER 13.000 RECIPES! Looking for new recipe suggestions? 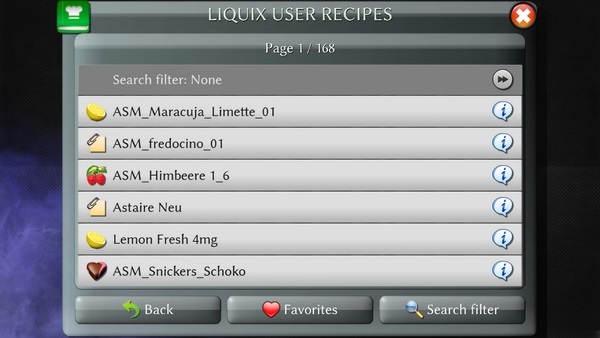 Then browse in the Liquix online database with over 13.000 recipes of other Liquix users or share your own recipes with others! FROM VAPERS, FOR VAPERS Liquix is designed with attention to detail - from practice for practice, from vapers for vapers. The app is specially optimized for easy and quick handling and is therefore the ideal daily helper when mixing your liquids. NO ADVERTISING, NO COLLECTION OF DATA Stop the data collecting madness! Liquix appreciates your privacy. 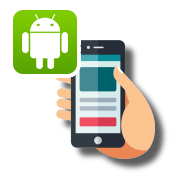 Liquix does not collect any data from your device, does not claim any unnecessary permissions except the absolutely necessary and does not bother you with advertising or any in-app purchases. Notes for users of the previous version: because we reprogrammed Liquix from scratch and completely revised it is unfortunately not possible to transfer the recipes of the old version into the new one. Due to the many new functions and improved recipe management, the upgrade is still worthwhile for all vapers! Can I transfer my recipes between Android and Windows? Liquix for Windows and Liquix for Android use the same data format. So you can easily transfer your recipes from Android to Windows (or vice versa). Simply export the Liquix data (in the 'Tools' menu) to a file and import that file into the other Liquix version. You can then use all your bases, flavours and recipes there, too and don't have to enter anything twice. Does Liquix support mixed bases? Liquix 2 now also supports mixed bases. For example, you can use a nicotine base that contains x% VG and y% PG. However, mixed bases are not really suitable for mixing because they cannot be used to produce any desired mixing ratio. The reason for this is purely mathematical: if I use a pure PG base for mixing, only the PG portion in the liquid increases. However, if a base contains both, the addition of the mixed base increases both the PG and the VG content in the liquid. To compensate this and to be able to achieve any desired mixing ratio, the addition of PG and VG is necessary. PG (propylene glycol) and VG (glycerine) are available very cheaply in litre bottles (e.g. on Ebay) and are indispensable for free mixing or dilution, so they should always be ready to use. I am using a mixed base - do I need additional PG and VG? 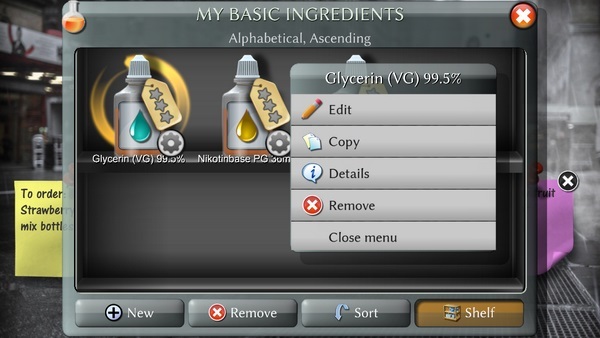 The problem with mixed PG+VG bases is that they already exist in a fixed mixing ratio. A 30/70/8mg base contains 30% PG, 70% VG and 8mg nicotine. And this ratio is ONLY right as long as nothing else is added. As soon as you add even one single aroma (usually PG), the PG proportion in the liquid increases, but the nicotine proportion decreases because the total amount of liquid changes. In order to balance this out and restore the desired mixing ratio, you need PG and VG as separate substances, which you can then add to the liquid as needed. Only then any desired mixing ratio can be achieved. Don't worry - Liquix will do all the arithmetic for you. Liquix demands a PG- and a VG-source when mixing, but will only use them if your desired liquid cannot be achieved WITHOUT using them. 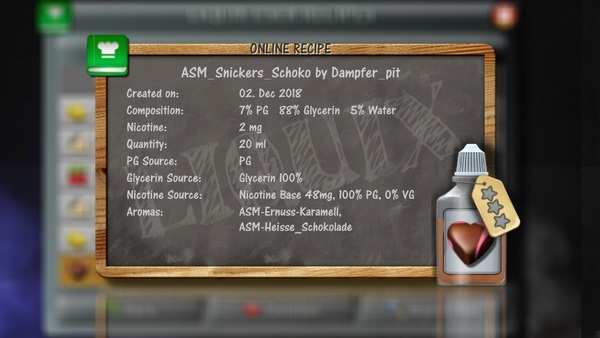 Where do I enter manufacturer names for flavours? With Liquix 2 you simply type the manufacturer name into the aroma name field. After three typed letters Liquix automatically enters the appropriate manufacturer name for you (this feature is called "Auto Complete"). So if you have a flavour from INAWERA FLAVOURS, just type "INA" into the flavour name field and Liquix will complete the complete manufacturer name for you. This saves a lot of typing. Liquix gets the manufacturer names from a list, which you can edit yourself in the menu "Settings". When you type, Liquix compares your input with the manufacturer names stored in this list. You can remove all manufacturer names in the list that you don't need - or add new ones. I am issing feature XYZ! Basically we are always grateful for user feedback. The more, the better. And useful suggestions for new features are always welcome. Please keep in mind, however, that Liquix is used by many different users (from beginners to professionals) with very different habits. So what seems to make sense for one user, might make the use of the app unnecessarily more difficult for others. Please always send us as concrete suggestions as possible. 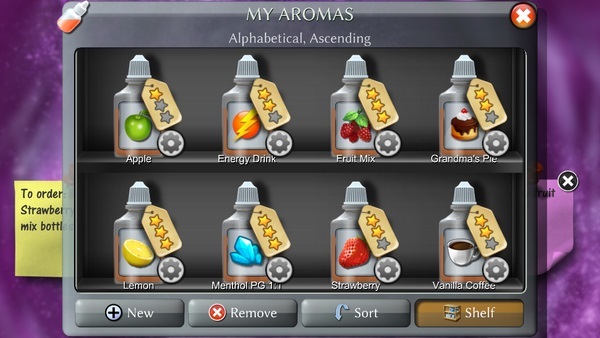 For example, a user asks for new aroma icons, but unfortunately does not specify which ones he would miss. That only leaves us to guess. If Liquix should cause problems on your device (the screen may be cut at some corner etc.) or to clarify a certain problem, it is always good to send a screenshot. In any case, our main goal is to keep the app as simple, intuitive and fast as possible. Feedback or suggestions that support this goal are always welcome, of course. How do I transfer and backup my recipes? Liquix offers an export function to transfer your recipes from one device to another (or just to make a backup copy of your data). The database, i.e. all ingredients and recipes, will be exported as a file. You can find this function in the menu "Tools". Simply copy the exported file to your new device and import the data there using the import function (also in the "Tools" menu). Why does Liquix always require a PG and VG source? If you want to mix with ready-made bases and therefore don't want to use separate PG or VG sources, you might wonder why Liquix requires a PG and VG source to mix a liquid. Very simple: because mixing without adding PG and VG is actually not possible at all. An example: You use a mixed 70% PG / 30% VG base and want to add an aroma. However, the aroma itself usually contains PG - and thus increases the PG content in your liquid. Your target of 70/30 is already exceeded by the addition of only one aroma! To get back to your desired 70/30, you have to add additional VG. So it's almost impossible to mix with ready-made bases that contain both VG and PG without adding separate PG or VG. However, Liquid allows this if you specify a PG source and a VG source. 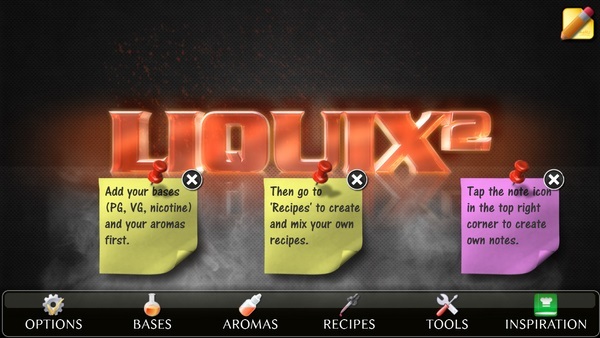 Liquix will only use these sources if your target cannot be reached without adding more PG or VG. What are the advantages of mixing by weight? 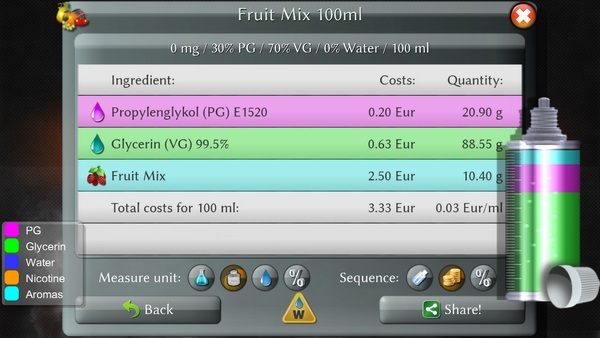 Liquix supports mixing by volume (milliliter), weight (grams) or drops. Mixing by millilitres is the most common, but also quite cumbersome method because it requires to use syringes and other equipment. It is easier to mix by weight instead - all you need is a digital precision scale (Ebay, Amazon). When mixing your liquid, simply add the amount of each ingredient displayed by Liquix in grams, that's all. 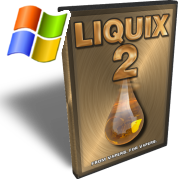 On some Windows systems it may take a few seconds until the program appears when Liquix is launched for the first time. This is because Liquix has to create a database the first time it is started, which can cause a small delay on some systems. It might happen on some Windows 10 systems that Liquix cannot save new ingredients or appears to hang while saving new data. If this is the case, please run Liquix with administrator rights. Otherwise Windows may try to block Liquix from reading or writing to the program's own database. Here is an instruction on how to run a program with administrator rights on Windows 10. 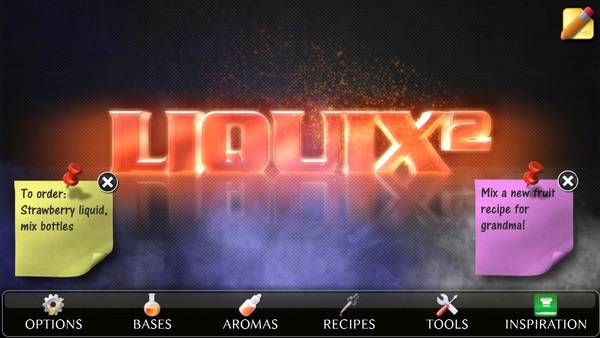 'Liquix' and its respective artwork is a property of X-PRESSIVE.COM.